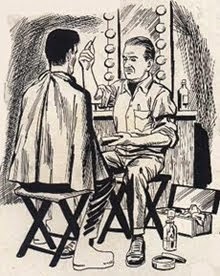 Details of Jack Pierce's career of his transition from silent films to his notoriety as head of makeup for Universal Studios in the early 1930's is murky. 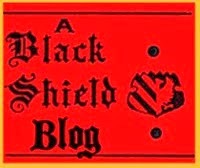 There are a few examples,however, of the evolution of his skill as a creative artist. One indication was his masterful work that turned actor Jacques Lerner from human to simian in Raoul Walsh's 1927 Fox production, The Monkey Talks. Pierce had an affinity for hair appliances. While his work using Yak hair on Lon Chaney Jr. in The Wolf Man immediately comes to mind, his creation of Jocko is, by comparison, startlingly realistic. 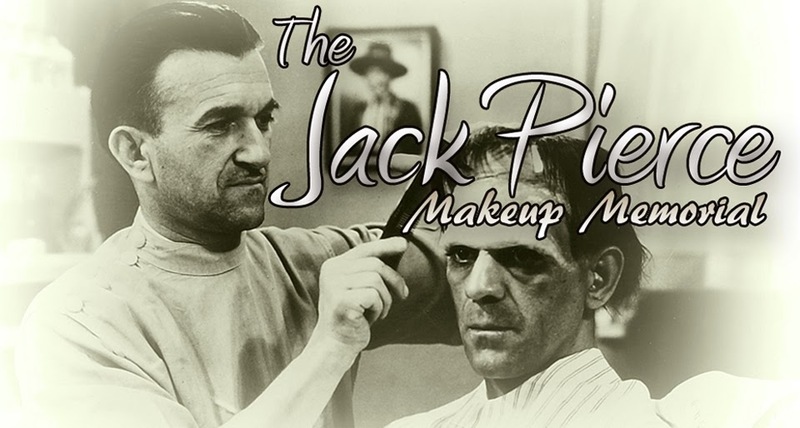 So much so, in fact, that it got the attention of Carl Laemmle at Universal, and it didn't take long before Jack was under contract with them as the head of their makeup department. 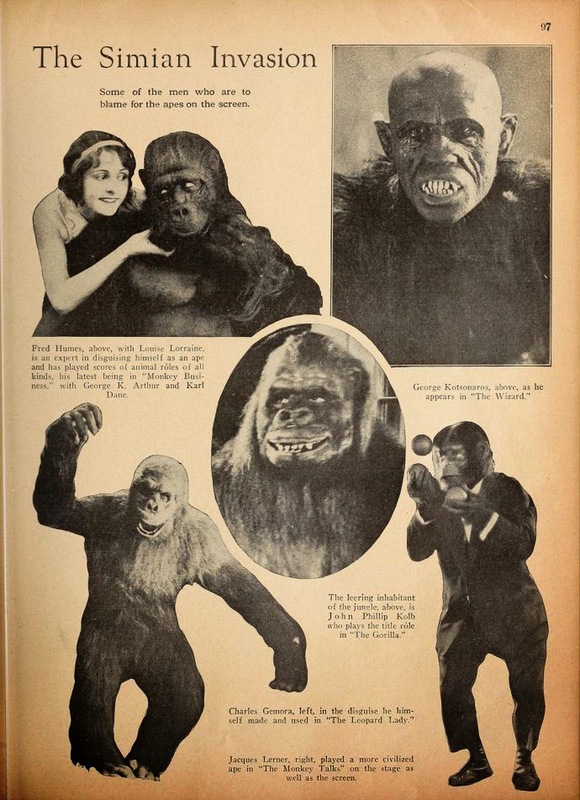 Seen here is a one-page spread from the April 1928 issue of Picture Play magazine. Titled "The Simian Invasion", it depicts five different ape makeups that were currently used in various films. Jack's Jocko is shown, as well as a photo of Charles Gemora wearing his own makeup in The Leopard Lady. 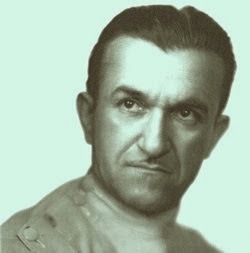 Most notably, though, is a close up of Greek actor George Kotsonaros as the "Gorilla Man" from the still-lost silent, The Wizard. Like the actor "Bull" Montana, Kotsonaros (1892-1933) was a big man. He became a professional wrestler after his short, five-year film career. He died tragically, in a car accident in Alabama. No makeup credits have been given to the Gorilla Man. 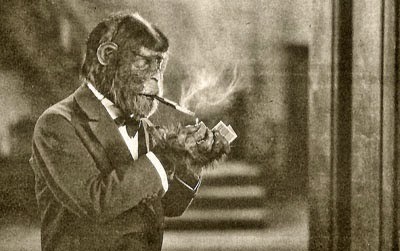 The Wizard was released on 11 December 1927 and The Monkey Talks had been released earlier in the year on 20 February. 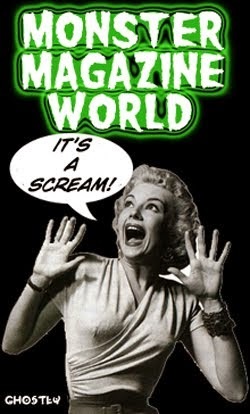 Both were produced by Fox Film Corporation (later to merge with 20th Century to become 20th Century Fox). 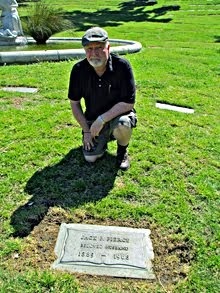 Kotsonaros was Greek and so was Pierce. Would it be too much of a stretch to consider Jack Pierce as the make up artist for this character, as well?